Lemieux Pipe Organ Company | Revitalization of the 1854 E. & G.G. 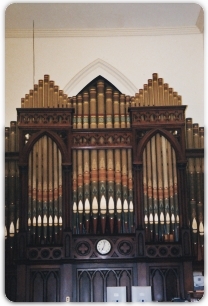 Hook Pipe Organ at Winthrop St. Baptist Church, Taunton, MA. In the fifties the chests were retrofitted with electro-pneumatic pull down action, to take the place of the original mechanical linkage from key to pipe valve. The organ has many beautiful sounds, outstanding casework, and beautifully stenciled facade pipes. Despite the electrification of the action it is still certainly an organ of historical merit, due to the beautifully crafted pipework which is almost all original to the instrument and unaltered. We will be doing selective restoration and extensive repairs to get the organ functioning and sounding its best. It is said that Ernest M. Skinner, one of America's greatest organ builders, helped pump the organ bellows while residing in Taunton and attending this church during part of his childhood.